Yasssu free download for Symbian s60 3rd and 5th edition. � Summary: Yassu offers you TV, Radio, Online & Print Media on Symbian s60 3rd or 5th edition mobile! Yasssu - TV, Radio, Online & Print Media on Your Nokia! YASSSU is the perfect media solution for News, Business, Entertainment, Comedy & Sports: enjoy your media anytime and everywhere - via 3G or WiFi - independent of broadcasting times: TV On-Demand - Podcasts of over 210 different on-demand TV-channels! Radio On-Demand - Enjoy 600 radio shows from 300 radio stations! Listen to print media - 750 newspapers and magazines keep you up-to-date! Private podcasts and blogs from 3,796 different sources! i tryed to install on sonyericsson vivaz S60 v5, installs only on Nokia phones! Can you help or is it just a gimmick? I am new to Podcast and totally new to yasssu. please show me how to add my selections podcast to yasssu. 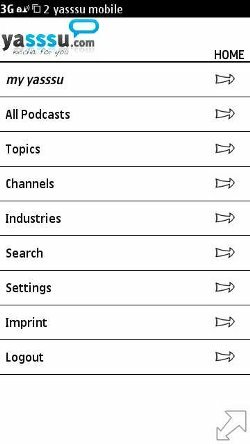 seems to me that I have no way to add any podcast beside the pre select podcasts by yasssu. any help will greatly appreciated. such a complex, nice and connected app being unsigned is crazy. Are they lazy or Oracle/Nokia is stupid? This APP is a virus. DO NOT DOWNLOAD. Great a1V I should cernaitly pronounce, impressed with your site. I had no trouble navigating through all tabs as well as related information ended up being truly easy to do to access. I recently found what I hoped for before you know it at all. Quite unusual. Is likely to appreciate it for those who add forums or something, web site theme . a tones way for your customer to communicate. Excellent task..